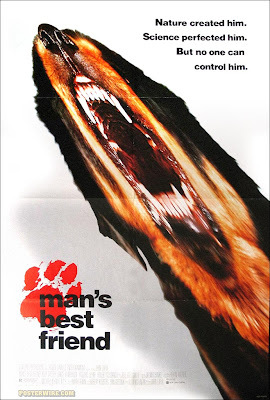 THE WEEKLY B-MOVIE NIGHT BLOG: You're The Dog Now, Dog. You're The Dog Now, Dog. Plot Synopsis: Bloodcurdling action and spine-chilling thrills put the bite into this howling sci-fi shocker starring Ally Sheedy (High Art, The Breakfast Club) and Lance Henriksen (Scream 3, Aliens). When an ambitious news journalist (Sheedy) breaks into a genetic research facility, she uncovers the biggest story of her career and unleashes the lab's most dangerous experiment: Max - a genetically enhanced guard dog with a vicious killer instinct. Superior sight, hearing, strength, and intelligence make him faster, stronger, and smarter than almost any other animal alive - and deadlier. Without the neuropathic drugs needed to curb his aggressive nature, his predatory urge runs out of control... and once he tastes blood, nothing can stop him.